The following five junior mining stocks are 10 baggers, through just the first half of the year. These are the best performing junior mining stocks on the Toronto Stock Exchange, as they have posted gains of 1,000% or more over the past six months! These junior gold and silver miners are generating significant wealth for investors that had the courage to buy when there was blood in the streets. An investment of $100,000 in any of these stocks six months ago would be worth over $1 million today! Gold and silver corrected and consolidated for over 4 years, leaving many gold bulls questioning their investment thesis. But precious metals bottomed in December of 2015, with gold bouncing off the $1,045 level and silver bottoming around $13.65. 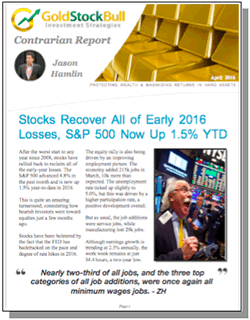 Both gold and silver have been off to the races during the first half of 2016. Gold is up nearly 30% and silver up 42%! As we predicted, mining stocks have been the best performers, offering leverage of more than 4 times the gains seen in gold and silver bullion. Larger mining stocks often outperform during the early phases of a bull market cycle in precious metals. This is because institutional money pours into the safer, larger cap mining stocks at a much faster pace than speculators jumping into junior mining stocks. But after this initial move, quality junior mining stocks tend to catch up and surpass the gains of their larger counterparts. Starting from a much smaller base, their have the potential for much higher percentage gains. But you have to do you research and select junior miners very carefully. You also have to go against the herd and be willing to buy when others are fearful. 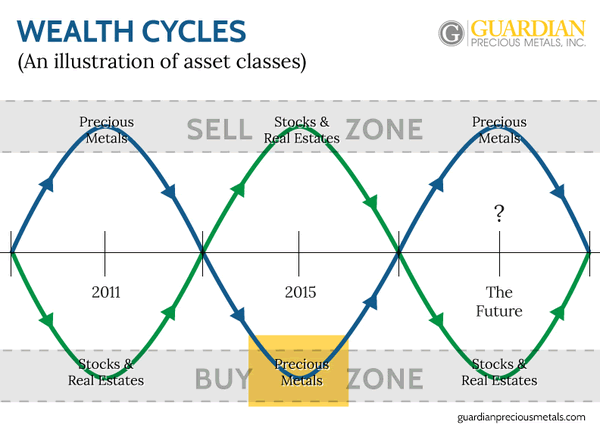 Smart gold investors understand economic cycles very well, such as the one below. With stocks and real estate and frothy levels, 2016 has been the ideal time to buy beaten down mining stocks at deep discounts. Despite these massive gains in gold and silver mining stocks, I believe they still have much higher to go. I am not looking into any magical crystal ball, but simply comparing the duration and magnitude of past bull market cycles to the current one. No matter if you are looking over the past 15 years or back to the 70’s, the data suggests this bull market in gold and silver is in the early innings. The chart below shows the HUI gold bugs index vs. the price of gold. The ratio has averaged around 0.32 over the past 15 years. Anything above this level suggests that gold stocks are overvalued relative to gold. Anything below this ratio suggests that gold stocks are undervalued relative to gold. While the current ratio has doubled from lows around 0.10, it is still well below the median line at 0.32. This suggests that gold stocks remain undervalued relative to gold and should continue offering strong leverage for the foreseeable future. Once this ratio climbs above 0.32, gold stocks will no longer be offering such clear value. They may continue to outpace the gains in gold, but at a slower pace until the ratio climbs above 0.50. At this point, investors may want to consider booking paper profits in mining stocks and allocating these funds towards physical gold and silver bullion. Using this strategy, I believe the average investor will end up with significantly more physical bullion and total wealth than via purchasing bullion alone and holding it. This is why we recommend a large allocation of mining stocks during the early phases of a precious metals bull market cycle. So, if you are ready to start investing in junior mining stocks, here are some of the top performing junior gold stocks and junior silver stocks in 2016. I imagine many of the stock picks on this list will also make the list of best junior miners for 2017. The gains listed here are over the past 26 weeks, as of July 15, 2016. Rupert Resources is a Canadian based gold exploration and development company that is listed on the TSX Venture Exchange. Rupert holds an option to acquire the Pahtavaara gold mine, mill and and claims to a land position of 124km2 in the highly prospective Central Lapland Greenstone Belt in Northern Finland for a total consideration of US$2.5 million. Pahtavaara is located some 35km by road from the town of Sodankyla. The deposit was discovered in 1986 and since operations commenced in 1996 the mine has produced 350,000oz of gold, with peak annual production of 37koz/a. The operation is currently on care and maintenance but subject to its decision to exercise its option over the property, Rupert Resources intends to commence a comprehensive exploration program to extend reserve life from the current estimate of 1.5 years to over 5 years and delineate further resources from the enlarged licence area before recommencing production. Gold Mountain Mining Corporation is exploring and developing the 100% owned Elk Gold Project, located in southern British Columbia, 45 km southeast of Merritt. The Elk property is a significant past-producing gold asset with excellent infrastructure. A Preliminary Economic Assessment (PEA) completed in 2012 reported that the project has good potential to support a viable open pit mining operation. West Red Lake Gold Mines Inc. is a Toronto based company focused on gold exploration and development in the prolific Red Lake Gold District of Northwestern Ontario, Canada. The Red Lake Gold District is host to some of the richest gold deposits in the world and has produced over 30 million ounces of gold from high grade zones, including 18 million ounces from the nearby Red Lake Mine and Campbell Mine operated by Goldcorp. West Red Lake Gold has assembled a 3100 hectare property which has a 12 kilometre strike length and 3 former producing gold mines. Silver Bear Resources is focused on the development of its wholly-owned Mangazeisky Silver Project, that includes the high grade Vertikalny deposit (amongst the highest grade silver deposits in the world) located 400 km north of Yakutsk, Russian Federation. With the support of its key Russian shareholders, Silver Bear is entering its second phase construction with the objective to target silver commissioning by the end of 2016. Colorado Resources Ltd. is currently engaged in the business of mineral exploration for the purpose of acquiring and advancing mineral properties located in British Columbia and is also seeking opportunities in Southwest USA and Latin America. Colorado’s current exploration focus is to continue to advance: the KSP property optioned from SnipGold, located 15 km’s along strike to the southeast of the past producing Snip Mine; its 100% owned North ROK property, located 15 km’s northwest of the Red Chris mine development, both located in northern central BC. These are the five best junior mining stocks so far in 2016. Is it too late to buy them? Will they continue higher at such a blistering pace or are the gains over? This is precisely the type of research that I perform gold subscribers. I will update this list on a periodic basis, perform due diligence on each company and make buy/sell recommendations for Gold Stock Bull Premium Members. You can try our service for just $95 by clicking here. We work hard at uncovering undervalued silver stocks with the potential to generate huge returns for investors. Below is a picture of me touring a silver mine in Mexico that I ended up recommending to subscribers after meeting with management. You can benefit from our hard work and research, simply by subscribing here for less than $1 per day.